It might still be summertime, but the holidays are just around the corner. That means the Q4 rush and corporate parties will be here before we know it. Speaking of corporate gatherings, perhaps you were tasked with organizing this year’s company shindig. Don’t worry! By taking a step-by-step approach, you will be thorough in your planning and make the process much easier. Keep reading for 10 tips to ensure a successful corporate party. Before doing anything else, understand the essentials such as who needs to be invited and what the budget looks like. Then it’s time to jot down a list of questions you may have. For example, what type of venue would accommodate your needs? Work with management in nailing down the feel of the event. Whereas some companies might prefer an upscale cocktail occasion, others would opt for a more laid back party with fun, interactive activities. So be sure to determine the goal of this event ahead of time. Let everyone know once the event date has been selected. Keep in mind that you don’t need to know the specifics at this time. The purpose of sending an initial calendar invite is so employees can start planning ahead. Ideally, complete invitations should be sent about a month prior to the event. It’s also a good idea to provide reminders two weeks in advance of the event. You should expect this to be the most time-consuming step of the process. Don’t forget that the venue you choose should reflect those in attendance and the organization itself. Again, this goes back to understanding the purpose of the occasion. If you’ve lived in St. Louis for an extended period of time, you might become overwhelmed at the number of options for a corporate event. So come up with a short list of possibilities and work with management in selecting the best possible venue. This tends to be one of the more overlooked steps of the process. Attendees probably won’t have much fun if the food at your event is subpar. That’s why we recommend getting in touch with a top-notch caterer. At Wild Flower Restaurant & Catering, our staff can handle all your corporate catering needs. 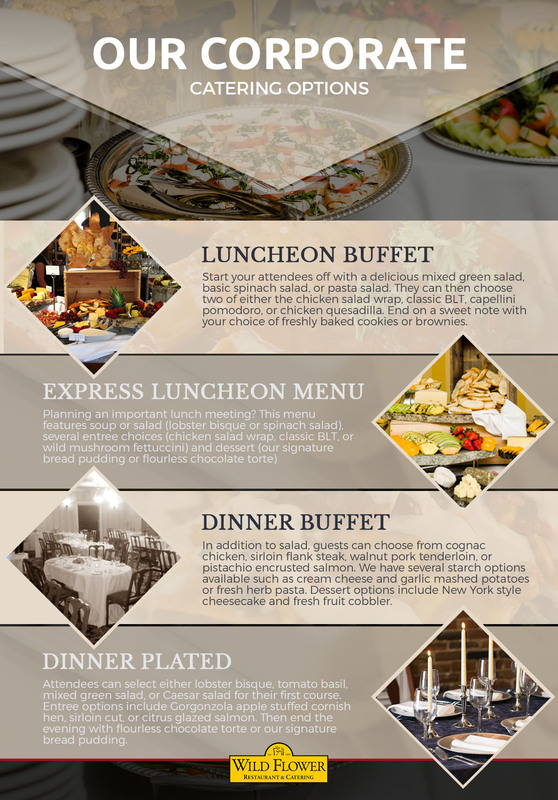 Not only do we offer a wide range of catering services, but we can easily customize a menu to suit the needs of your event and attendees. The Wild Flower staff has been a popular choice for company parties since 1995. By this point, you’ve booked a venue, hired a caterer, and sent out the final invitations. There’s not much left to do besides showing up to the occasion and enjoying yourself. After all, it’s a party, right? Wouldn’t you rather figure out your company’s holiday party now when everything isn’t already booked? 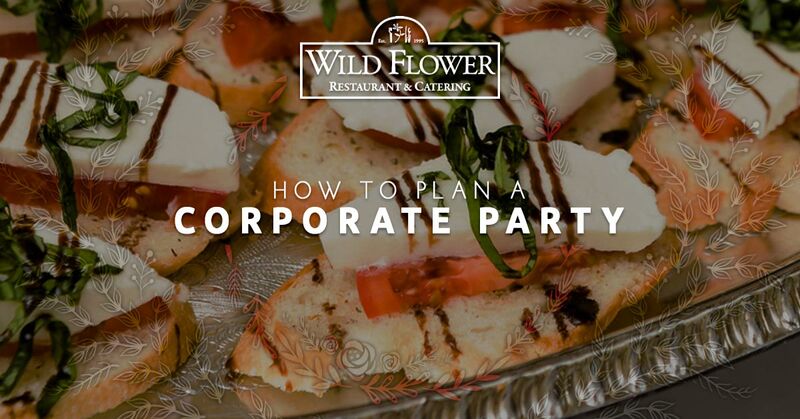 The Wild Flower catering team will do everything possible to make your next corporate gathering a memorable one. Get in touch with us today to get started.